Remember this Food Pyramid? This will make you FAT! Print it out, rip it up, and throw it in the trash where it belongs! If your Personal Trainer tells you to eat like this, you need to find a new Personal Trainer. I have yet to meet anyone who can make much sense of that! Remember Dr Atkins? He told us to eat almost no carbohydrates. He was attacked by many, adored by others. As usual, the truth is usually somewhere in the middle. Dr. Atkins had a point, but went too far with it, and also made the huge mistake of lumping most carbohydrates together in the same prohibited group. That's just plain wrong. Sugar doesn't affect your body the same way peanuts or navy beans do. We Like this food pyramid much better, but still think it has problems. Oils are on the bottom?! As world reknown Personal Trainer Phil Kaplan says "Fat is probably not the best thing to eat all the time if you're trying to lose fat." 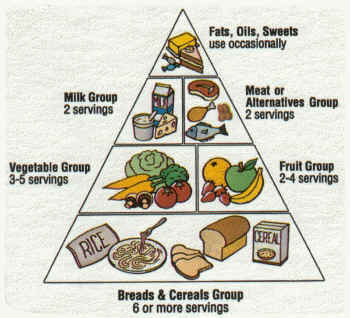 So We're coming up with our own food pyramid, and will have it out as soon as our graphic artist makes it lok pretty. Check back soon. Chicago Personal Trainer's Food Pyramid!